Back In The World Of Round Food... Genuine Round Food!! Those of you who've been following along know that I'm nostalgic for the New York area. Living in Chicagoland, despite a rich culinary history there, I've noted a deficiency in round foods, specifically bagels and pizza. It's just not the same. Michele knows what I mean, I've been telling her about this for years; and more recently anyone else who will listen, especially in the midwest, has gotten an earful from me on round food. 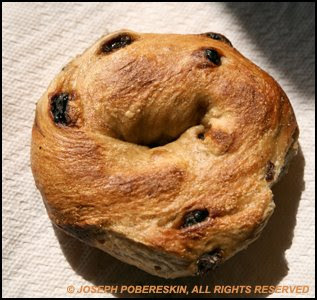 Okay, so all of you non-New Yorkers pay attention: above is a picture of a raisin bagel procured fresh this morning from Sonny Amster's a/k/a Sonny's Bagels in South Orange, NJ. Note that the texture is rough hewn, from being hand-rolled and boiled before baking! If you could bite the picture... don't, you'll get a mouthful of glass... you'd notice that some of your teeth are loose after you've eaten it. That's a bagel!! Everything else is ersatz, fake... phony. Don't anyone write back and tell me about Dunkin Donuts bagels and how good they are or how good their coffee is. I'll cover those misconceptions in another post. Can't argue about the bagels, but I am hooked on Dunkin Donut's coffee! I guess I'll have to educate you!! Joe, every night I sit at the computer with Dunkin' Donut Joe, and my cans of Altoids!! It's like heaven. I honestly can't remember the last time I had a DD bagel. Really. But next time you're in Maine, we're going to Scratch baking in South Portland, where they make the best ersatz bagels known to mankind. Naaaah. I'm with you, Joe. 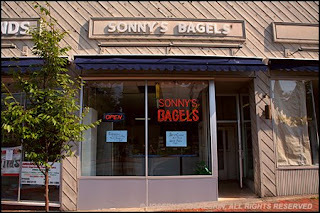 I miss bagels from the East Coast. Living in Kansas City is hell for someone who is used to the finer culinary treats!